From captivating performances and passionate, driving original songs and music, to stomp-your-foot pub favorites and endearing ballads, Erin's Guild truly is a band for all fans of Irish and American music alike! 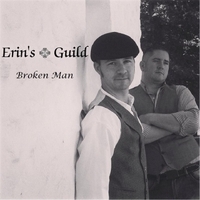 Erin's Guild is a high energy mix of contemporary, traditional, original Irish and American music, based in the South Shore/Boston area of Massachusetts. Founded in 2010, Erin's Guild can be found performing throughout New England and Internationally. Erin's Guild includes Geoff Roman on vocals, fiddle, guitar, banjo and concertina, Sean Fell (Sean Óg) on vocals, guitar and harmonica and Susan Young on bodhrán, vocals and whistle. With varying backgrounds in music, the 'Guild has successfully blended a combined musical experience of 70 years to bring a unique, yet recognizable, sound and show to their audiences. Geoff Roman attended Central Michigan University and received his B.S. in Violin Performance. He has brought his skills to a wide range of genres and played with a variety of Internationally Renowned sitar, blues, jazz, flamenco and classical artists. He also performed on a Guitar Center sponsored National Tour, with the Dave Matthews Band Tribute Band, The Tripping Billies, before moving to the Boston, MA area. Sean (Sean Óg) Fell (Co. Kerry) attended the Irish-Catholic Mercyhurst University's D'Angelo School of Music in Erie, PA. There he pursued his B.S. in Music Education with a Concentration in Vocal Performance and Piano. While Sean co-founded Erin’s Guild along with Geoff Roman, he has also performed with the All-New England Choir, the Hartford Chorale, in various Off-Broadway Productions and has performed at Lincoln Center and The White House. Sean currently resides in Dover, NH. Susan Young has performed many different genres of music; from Choral to Classical, Motown and Medieval. Susan is an accomplished bodhrán player of more than 17 years, crediting Christopher Murphy as her mentor early on. She has attended and played in many traditional seisiuns throughout New England and also studied with Sean Nos singer, Roisin White, of County Down. Susan has performed with the New England Irish Harp Orchestra (NEIHO) from Boston, MA; Reaganta of Concord, NH; and Boghat of Portland, ME. Susan is also a member of the All-Female Celtic/Maritime group, London Julie, based in Portsmouth, NH. Together, Erin's Guild has toured throughout New England and Europe and has been seen main stage at the Boston, Westfield and Dorchester, MA Irish Festivals, as well having members perform at the Baltimore, MD Irish Festival. They have been featured on various radio programs, including Boston's WROL 950 am and Dublin City Radio 103.2 fm. The three, drawing on and combining their past musical experiences, create and bring a unique, energetic, audience engaging sound and show to their performances. The Trio love and enjoy sharing their passion for their culture and their music, both traditionally and contemporary, to help pass it along to future generations.